First Eye Care is proud to help patients of all ages reach peak vision health through a combination of professional efficacy and compassionate care. No matter what you, your child or another loved one needs, we can help you get it in the shortest amount of time. It all starts with eye and vision exams. Why Get Eye Exams from an Arlington Optometrist? At First Eye Care, the goal of our optometrist team is to provide comprehensive, primary eye care for the whole family. In order to maintain good eye health, you must know your prescription to ensure your eyes aren’t strained by out-of-date contacts or lenses. Moreover, it’s important to spot vision problems the moment they arise so you have the best chance of tackling them. By doing so, you enable our optometrist to provide treatment options, in many cases restoring or preventing vision loss. Depending on whether or not you are at risk, the American Optometric Association recommends yearly or bi-yearly eye and vision exams. If you’re worried about eye exams, don’t be. We make the process fairly simple, starting with a brief chat about your medical history, family history, current symptoms, medications you’re on, work environment, lifestyle and health. From there, we can assess what your vision trouble may be and use targeted tests to get more information. Our eye exams include standard wall chart and reading eye chart tests, cover tests, manual refraction tests, retinal exams and more. We will test your visual acuity to ensure your prescription is correct – or to determine what it is, in the case of patients who have never before had eyewear. We may also prescribe eye exercises in order to keep your vision as clear and your eyes as healthy as possible. 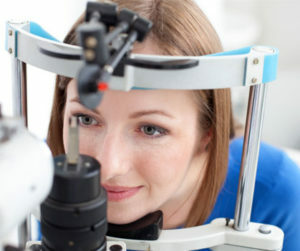 We test eye functionality in addition to vision testing. These exams may include tests to evaluate depth perception, color vision, eye muscle capabilities, peripheral vision, and responsiveness to light. We may conduct other tests to determine whether your eyes are focusing, moving, and working together properly. The results help us to diagnose any underlying conditions that could be impairing your eyes’ ability to focus or work together. We also perform a visual inspection of your eye and eyelids under magnification to ensure your overall health. A tonometry test will give us information about intraocular pressure (IOP), which can further help us assess if your eyes are functioning as they should. From there, we can make an even more targeted eye treatment plan. If you’re looking for a full-service optometrist who provides emergency services, diagnosis and treatment of eye diseases and vision trouble, and glasses and contact lenses, we can help. Give us a call at 817-860-9050 to make an appointment or ask any questions you might have. Our friendly team will be happy to assist you.